All of these are definitely factors in better personal branding. I found that when I went to conferences that I was scheduled to speak at, that I was happy to know that when I introduced myself, most would associate me with the pink guitar in my logo and my slogan. I wanted people to know that I was there to help them do more than 100% when it came to their brand and site. And it worked. 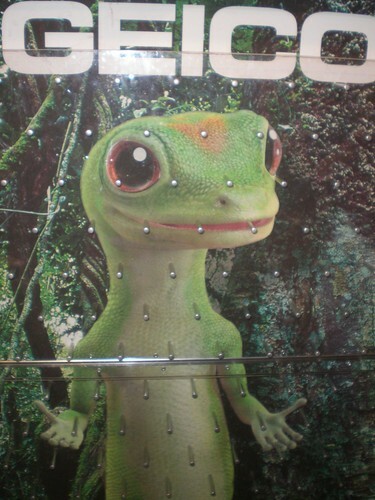 I think the Geico Gecko is cute, but I really never thought too much on associating the Gecko with insurance, just that it was like a mascot. I get more on trust from people I know who use Geico, rather than the commercials. There are loads of people online that tell others about their experience and that works more than a character. Nile, you made a couple of good points. On the one hand, it’s nice to have a symbol or logo that represents our brand. On the other hand, providing an over-the-top positive experience to our customers, online and offline, is the most important part of our brand. You are so right. Building a brand requires that it be unique, consistent, recognizable and relevant to the desired customers. I have been building my brand of Healing Through Love and Creating Healing and Love Now. So I am not as focused on such issues as “What to do on a first date,” although I am willing to answer that question if it is asked. I am not so focused on “10 simple tips for manipulating your lover.” My focus is on knowing your self, healing your self, understanding relationships and working alone or together with a partner to heal. Building your own unique brand does take time and giving a consistent, relevant message. Dr. Erica, I’ve really enjoyed hearing about the arduous process you’ve gone through to carefully think through your personal brand. It’s challenged me to do the same. The beauty of committing to the process of identifying our personal online identity as well as the customers we want to serve is that it really does help us write more specifically and with impact, as you pointed out above. Hello, you made good points here and i can’t agree more. To follow individual brands is said to be selling every single service or product under a distinctive brand name, and you are absolutely right! Hey Steve, each of your points hit the target with branding, but I think Consistency is maybe one of the biggest challenges businesses face. It’s easy to lose sight of the fact that every thing we do, every communication or image – adds to or detracts from the brand we are building. Too often the messages become blurred and diluted. Marquita, you make such a great point. When the company is small, or at least when the company is You or Me, we can stay consistent by reviewing our mission, vision, and values on a daily basis. Do you have any other thoughts on how to stay consistent? My business coach has been on me for a while about getting very clear on my brand. I realize that when we are unclear and have difficulty talking about our self, it is actually uncomfortable, and we are less likely to share our self with others. We have a brand whether we are aware of it or not. The brand called ME is one of the most important parts of my business. Rachel Lavern@Life for Succss recently posted…What Are Your Limitations? Rachel, I’d be interested to hear some of the clarity that you’ve received as you’ve worked on getting more clear on your brand. This is a subject that I confess that I don’t have a lot of knowledge in. I hear about it all the time but I haven’t taken the time to really dig into it yet. I believe it is time that I do! Kevin Martineau recently posted…Why do we overspend? Hi, Kevin. I’m excited to see what you discover in terms of your own personal brand. Keep me posted! A brand must be personal. As a former network marketer I was finding it very difficult to hang my hat under another’s moniker. It wasn’t something I was willing to own. Not until my wife and I took on our coaching practice were we both able to begin to live our initial brand. I say “initial” because I think that brands start in one place and evolve into permanence. Look at Mickey Mouse or the Quaker Oats logo, both have morphed into their present state. At some point ones branding will “click” lock in, feel and be right. You have just got to start digging into yourself. Rick, it’s very exciting to see you live your brand. I know you and your wife have put a lot of time, reflection, and work into creating your personal brand. I also appreciate your comment about brands being able to change and grow over time. The important thing is to get started with the digging process (great analogy). Great article, Steve, and right to the point. A lot of extremely valuable information in a few succinct words. Excellent! I would also recommend a set of short articles (“Ramblings”) (http://www.theartofhype.com/ramblings.php) written by a good friend and colleague of mine who is an absolute genius at guerrilla marketing. He has been a huge help to me over the past several years. Creating your own brand is very important for business as people will embody your business with your brand. You developed very good tips of which the most important, in y opinion, is consistency. You have to be consistent if you want yo brand to be recognized. Changing too often will do no good to your business. Steve, this is an awesome article! I never thought about the idea of branding for my personal life and values before. But everything you said so perfectly applies to how we live our lives. I love the Tom Peters quote you started with. Our credibility and capacity to touch others’ lives through our work on our sites and elsewhere are directly connected to how distinctive, relevant and consistent we are with what we advocate and how we live what we advocate. Great post. Loved this new insight. I have long believed that we have to make a strong stand based on our values and then we are building the reputation and brand that we want to build! Lynda Cromar recently posted…How To Build Your MLM Network Marketing Business – 8 Ways To Get Laser Beam Focused And To Make Each Day Count! I think keeping the logo design of the company is also important and falls under the consistency success factor. It just occurred in me because I saw a photo of logo comparison between coca-cola and pepsi. Coca-cola has never changed it logo ever since whereas pepsi had more than 5 I guess. Although I’ quite new in marketing I can see a pattern when we talk about branding, these are the keys you are emphaosizing in your article Stephen. Branding presupposes for solo preneurs knowing our strenhgs as bsiness people and persons and having tested in the market that what we serve that is a mix of unique features in our products and services has an echo in our market’s needs. It takes time, consistency , presence, listening and creativity to stand at the top as a brand. And the results are worth it because people associate us with our logo and a set of positive emotions before saying Yes to our products and services. thanks for this great post, as always filled with useful informaton. this is a remarkable post. You have presented key factors in what it takes to brand oneself. I would like to direct your attention to “Why”. I have been experienced to speak with large groups of people, for the benefit of empowering them to do more with their life and time. To develop lifestyles and not just going through life. You make valid points and still I was seeking the why. People believe more in themselves able to do what your doing (Duplication) by knowing why you choose to do what you have been doing. What is your passion and why did you give up working for someone else, to being creative and leearning how to share you passion with generating revenue, that has given you a lifestyle. This is the key to branding oneself: Sharing your passion and empowering others to hunger which will manifest thier passion. Then showing each one how to generate revenue by simply sharing their passion to others. Lets just keep it this simple. The team that surrounds you with support in every area while you develop your business, is priceless. Always utilizing due diligence each step of the way. Stephen, your an awesome young man, and a great mentor in our industry. You have demonstrated nothing but character since my meeting you. I will continue with my support and look forward in seeing your next wonderful impactful article. William, thanks for the thoughts regarding the importance of Crushing It by living our passion and helping others discover their own. Of course, there needs to be knowledge and discipline coupled with that passion in order to make it in the long run, would you agree? Great post on branding. It’s a blast being Me, Inc. The three main subjects you discussed about developing your brand is Distinctive, Relevancy, and Consistency. I think the toughest one is being distinctive. There is so much competition as a marketer and it takes a lot of effort and persistence to stand above the crowd and be unique. “In order to be distinctive, both in your business, and in your life, you need to think about what you specifically stand for, and what you represent.” This is a powerful statement because it reflects an “overall” representation of your personal and professional life. They both need to intertwine into one solid message. Thanks for your post Steve! PS I agree with Nile. I never associated the Geico with insurance, but the little guy shows what master branding expert marketers do with anything! Worldwide recognition. Raena Lynn@empowered hour recently posted…My Blog Made Me Proud-Thank You For Voting! Hi Steve, what a great article, thnaks ! For me, the stand out ‘nugget’ was: “A strong individual brand is relevant: what it stands for connects to what someone else considers to be important.” There is absolutely no point in having a brand that others don’t or can’t relate to. Your brand must convey your values but in order to be relevant – ie. effective – those core values must also be the core values of your customers. You can have a very distinctive ‘brand’, however, No connection, no sales! Good point, Mandy! The importance of studying and understanding our customers can never be under-estimated. Thanks for the insight. I couldn’t agree more! I am just in the beginning of my business and marketing but so far I see that all this is true and of a great help. Anna, I’m glad you found this helpful, and I wish you the best as you move forward with your business!